You might be thinking, "What is an S-Class Merc doing on CAR137.com?!" Well I had one over the weekend, this exact car in fact, for my wedding car. I have never been in a car with so much technology on display. It's incredible what you can do and I was amazed at how easy and intuitive it all was to use. The main thing I wanted to try out was the night-vision and I got to try that on the way out to Piha. Awesome! My bride was a bit worried because I was looking at the screen instead of the road sometimes but I could actually see more in most cases because of the poor road lighting. I'm not sure how often you would use it in New Zealand but if it was belting down or your headlights were out it would be very useful. 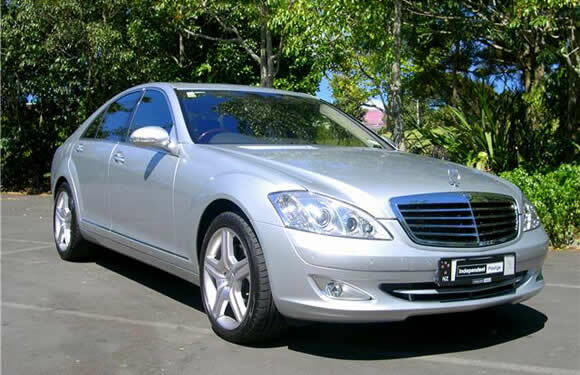 For such a big powerful car I found it harder to drive fast than the Bentley Continental Flying Spur I drove recently and it dawned on me this is just a BIG cruiser. BIG being an important word here. The seats are 'spacious' and don't offer a heap of support. More like a comfy lounge chair. Which would be fantastic for long distances and larger people. I felt like I had a lot of room to move. Everything seemed far away for me and I felt smaller than my 5"11. What was impressive though was the power delivery. Smooth and like a constant push in the back. Plenty to get you moving but not enough to be in awe of or scared of. Handling was interesting because it just got on with the job of going round corners and flattening any surface. Perfect except I couldn't work out anything nice to say about it. It just handled. It is a beautiful car to look at. Impressive Mercedes stance, big wheels and sharp lines. My overall impression of it was of a heavy car. It felt heavy, it looks heavy and it's the type of car a heavy might drive or be chauffeured around in. Great car for eating the miles or hauling your family around. Thanks to Lee at Independent Prestige for loaning it to me. If you want to buy this impressive caryou can view it on the Independent Prestige website. "Wedding car". "Bride". It sounds like congratulations are in order! Thanks Shaun. Yes we got married on Friday. Driving this was pretty cool.